Do you want to track moles of family members but keep their images seperate from your images? That is now possible using Family Mode. To set up a new profile, click on the family icon on the home page. You will then be asked to set up a profile for each new family member. Once you set up a profile a family member they will have their own homepage, and you can move between homepages by swiping left & right. 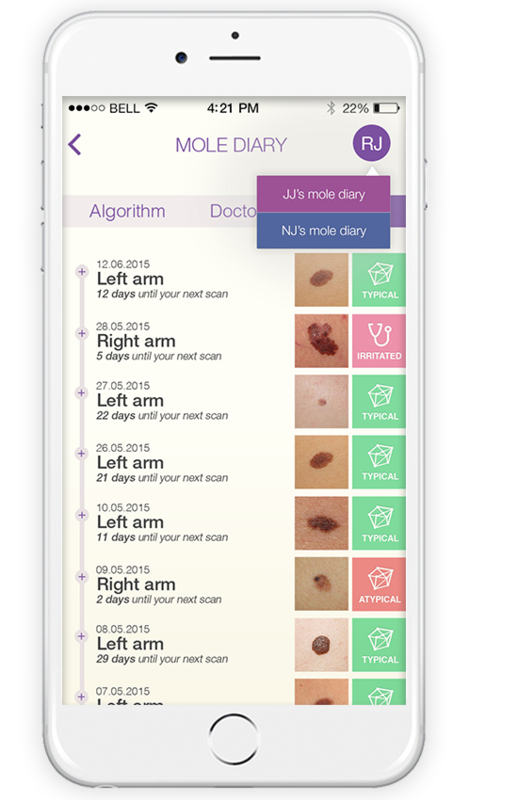 Note that in other sections of the app, including reminders and Mole Diary, each family member will be identified by their two initials. You can switch between reminders and the Mole Diary for different family members by clicking on a user’s initials. In the example below, RJ’s Mole Diary is shown. By clicking on JJ’s or NJ’s initials you can switch to their Mole Diary.